Dogs are not just our protector against bad elements, but they also provide us with hours of entertainment and endless love and affection. After your busy day in the office, you will get relieved when you come home with your dog jumping and licking excited to see you. If you treat your dogs right, they will display affection that will make you feel better. You can even teach them some dog tricks. This will make you become even closer to your pet dog. Teaching him these cute and funny tricks will help stimulate his brain. Of course, you can start with the basic commands like stay, heel and sit. Properly training your dog at an early age helps with mastering tricks, but we believe old dogs can learn new tricks too! 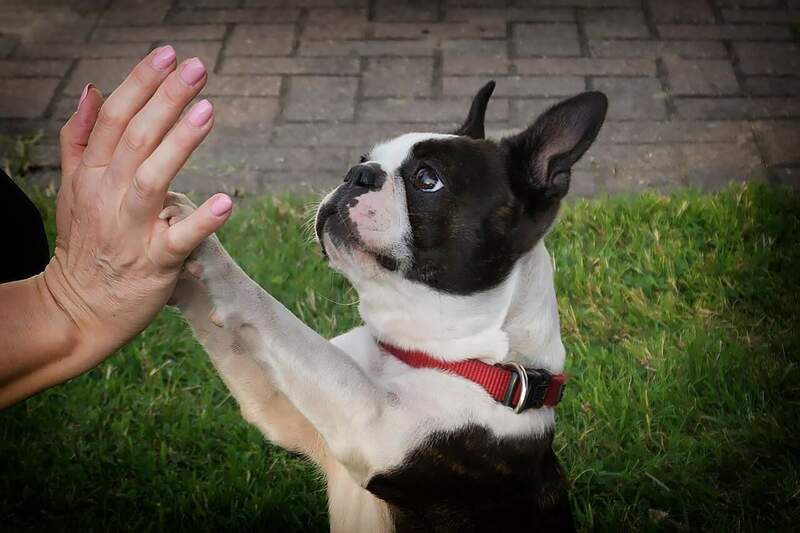 If you want to teach your dog a trick that will amuse your children, high five is a good one. Start by telling your dog to sit, and give him some treat as a reward for following you. Then, hold a treat in front of him, but a little bit out of reach. Don’t forget to say the words “high five” as you gently tap one of his feet. Your dog will raise his foot to paw at your hand where you hold the treat. As he raises his foot, catch it using your free hand. As soon as your hand and his other foot get in contact, give him the treat and praise him. Repeat these steps until your dog memorizes it and raises his foot every time you say “high five”. In case your dog needs more motivation to help him raise his foot, you can touch the inside of his knee using your finger until your dog bends his leg. Once he raises his paw, tickle the bottom gently to make him raise it a little bit higher. Say the command slowly and with a firm voice as you do the steps again. Some dogs can perform this trick without you telling him the command. Try telling your dog to sit and then raise your hand in front of him. That action might be enough to get him to give you a high five. 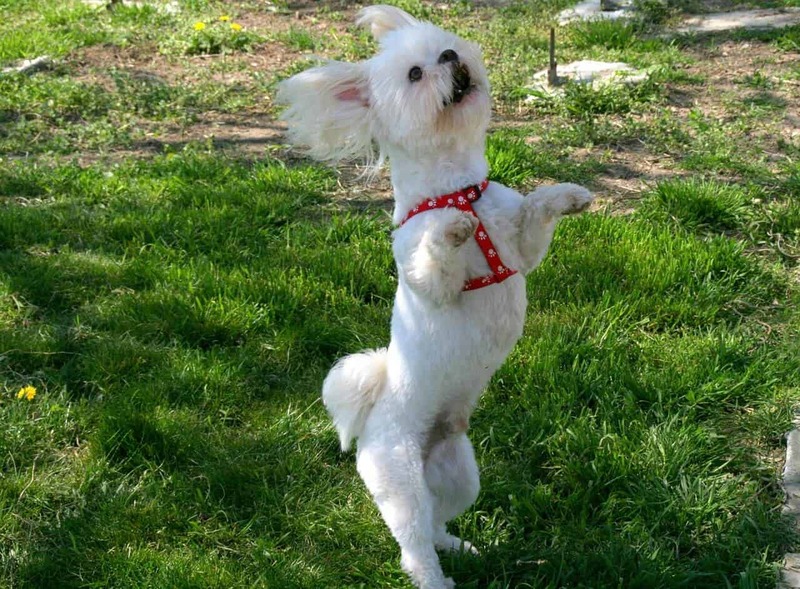 Your dog’s physical fitness will be improved if you teach your dog this trick. 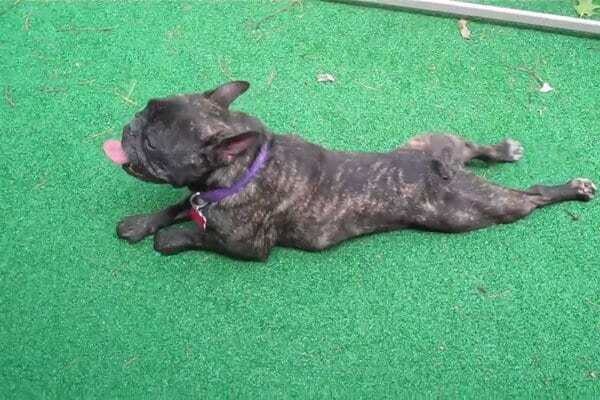 By nature, dogs know how to crawl, the challenge with this trick is to make him crawl when you told him to do so. Start by telling your dog to lie down. Keep the treat in your hand firmly so that he can smell and lick the treat, but do not give it yet. Keep your dog’s attention on the treat, and then gently drag it into the floor. As soon as the dog crawls a few feet, give him the treat and praise him. If he stands up to take the treat, take it away, and begin the training again. Each time you repeat the training extend the distance. As soon as he has mastered the trick, tell your dog to stay, walk 10 to 15 feet away, and then let him crawl towards you. This is a great skill for smaller dogs, but for bigger breeds, they need some encouragement before they can learn the trick. This trick is not recommended for overweight dogs or those with their hind leg problems. Start at a sitting position, and slowly raise the treat over your dog’s head. Tell him to go up, spin or dance as he rises up on his hind legs. You can move the treat a little bit behind your dog’s head to make him stand up. If your dog is able to balance himself, hold the treat in front of this nose, and then move it slowly around his head to make him turn around. Bigger breeds like Bull Mastiffs and Labradors might be a little bit unsteady on their feet at the start, so let them get accustomed to standing first before they make their spin. Some dogs may have difficulty following your instructions, but eventually, they will learn the trick. Just be patient when teaching them these tricks. Just like human they need to practice it every day to memorize the trick or get accustomed to your command.